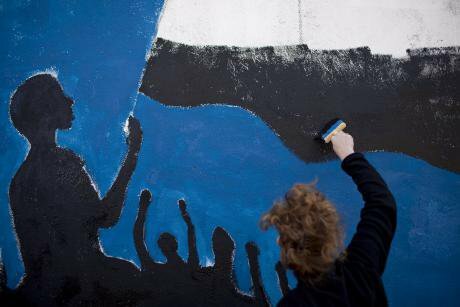 A young woman works on a mural in Lisbon Sunday, Feb. 24 2013. AP Photo/Armando Franca. All rights reserved. Manuel Serrano: The Fórum dos Cidadãos (Citizens’ Forum) aims to strengthen democracy in Portugal by making the voice of ordinary citizens heard in important public debates. Where did the idea come from? Lourenço Jardim de Oliveira: The principle of public deliberation is a very old one, tied to the roots of democracy itself. In that sense, The Citizens’ Forum is not a new idea but rather an updated remake of an older principle. We have seen many countries embracing modern and innovative forms of public participation as an attempt to revive democracy in places where it has often been taken for granted. Initiatives such as the Citizen Juries in the US and Australia, or the Citizens’ Assemblies in Canada, Ireland or the Netherlands have all a common purpose: to bring some fresh ideas into our democracies and to put citizens back into the center of the political system. 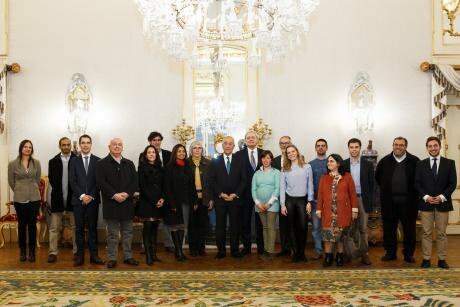 The Citizens’ Forum is inspired by these foreign initiatives and is being promoted by a small team of dreamers who want Portugal to reinvest in the concept of citizenship and become an example of good practices. The Citizens’ Forum is a nonpartisan civil society initiative organized by a team with a proven track record and benefitting from the guidance and expertise of an advisory board that includes some of the world’s leading authorities on participatory democracy. MS: To what extent do you think that experiences in countries such as Canada, Iceland and Australia are scalable? LJ: We have been in close contact with the teams leading these experiences in Canada, Iceland and Australia, as well as the US, Ireland or France. In some countries, it has become more than an experience and you now see processes of public deliberation being institutionalized as they prove to be efficient in promoting citizen engagement and better decision-making. Most of these projects are growing and gaining more and more influence in political life, which is a sign of hope for other fresh initiatives like ours. I believe that we cannot simply copy foreign models and methods. We can learn a lot from them, we constantly ask for advice, we use many of their tools, and we share our ideas and experiences regularly. But there is no unique method to build spaces of civic deliberation. Each project has to adapt to local characteristics and dynamics. Building a citizens’ forum in Portugal or in Switzerland is certainly not the same. In order to develop the Citizens’ Forum in Portugal, we had to adapt to the specificities of our democracy, our public life, our history and our political behavior as a society. Only then can we consider having a real impact and fulfilling our mission. On the other hand, it is quite impressive to see how, despite the distance, different initiatives in countries around the world can support each other. When we presented the results of the first edition (January, 17, 2017) of the Citizens’ Forum, we had Professor David Farrell travelling from Dublin to attend the session and share with participants his experience in leading public deliberation projects in his home country. This shows that many countries are dealing with same issues and it is important that we work together in designing innovative ideas. Technological progress has been boosted by a global movement of entrepreneurs, using each other’s solutions and influence to promote new ideas. The same should happen with democracies. We should be seeing more “political startups” by now. Unfortunately, the only political movements that seem to be uprising and cooperating internationally are related to populism rather than innovation. Portugal can become the first nation to have a regular, national-scale public discussion that is both informed as well as reasoned on the most important choices facing the country. MS: Do you believe there is a disconnection between what citizens want and what politicians do? How big is the gap? LJ: Recent events in the US and the UK as well as the evolution of populism in other European countries clearly show that the gap between citizens and politicians is not only real, but that it also affects countries where democracy used to be taken for granted. Citizens do not feel identified with politicians anymore. They are not just complaining about corruption or the mismanagement of public resources. The priorities of politicians are simply not the same as the priorities of common citizens. In Portugal, the financial crisis has led politicians and most media companies to focus on banks, public debt, public deficit and taxes. These topics are important and have an impact in most citizens’ lives. But they have completely absorbed the attention of politicians, who have overlooked the real problems that any citizen faces in his or her everyday life. News channels have contributed to this and have failed to understand and expose these realities. This leaves citizens with no voice other than the ballot, thus feeling neglected by what some call “the system”. This gap is big enough as to bring half of a country’s population to vote in a way the media could not predict. Recently in Portugal a group of academics worked with the government to run a very interesting exercise: they organized a meeting between 60 citizens and the government, where the citizens were free to ask their questions and get a direct answer. Used to dealing with journalists, the members of government prepared for questions regarding the banking system, the public deficit and political scandals that have been in the front pages of most newspapers. But it came as a surprise to them that the vast majority of the citizens’ questions was about the functioning of the welfare state, health, education and employment – that is, far from the priorities of journalists and politicians. 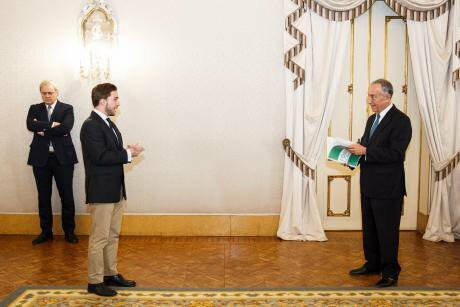 Presentation of the results of the 1st edition of the Citizens' Forum to the President of the Republic. Palace of Belem, Lisbon, Portugal. January 17, 2017. Photography: all rights reserved. MS: Democracy is being attacked from several fronts right now, as cynical autocrats, racist populists and ignorant charlatans are cashing in on the protest against the established state of affairs by a substantial number of unsettled citizens. Who is to blame for this? Is it the media, for failing to inform on and debate the most important political questions of our age? Is it the intellectuals, as in Weimar? LJ: I usually prefer to think about solutions rather than who to blame. Naturally, we must have some diagnosis in order to understand how things have gotten so out of control. Probably, the elites have taken their position for granted and are now struggling to keep up with the constant changes the world is going through. The media, on the other side, are struggling to find sustainable business models in an era where everyone wants free access to information. I believe both share some blame in putting the citizen’s reality aside and focusing on other priorities. The result is that they no longer understand citizens, which is ultimately devastating for our democratic systems. On the other hand, having a proper diagnosis of the problems that democracy faces requires a certain degree of self-examination from the citizens themselves. One of the conclusions we reached during the first Citizens’ Forum in Portugal was that citizens recognize their own lack of engagement and participation in the public life of the country. This is an essential step in the process of reviving democracy. It is only natural that, feeling disappointed and often forgotten, citizens lack the motivation to participate – as shown by the abstention levels in Portugal (over 50% in the last parliamentary elections). But the best way to reduce the gap between the people and the politicians is precisely getting citizens to become more active. We need to break this vicious cycle. Our work aims to structure public debate and direct it in a constructive and responsible manner by making the public listen to a pondered, informed voice that comes from within Portuguese civil society itself. MS: Do you believe that participation can replace representation? Or are they complementary? LJ: There are different models of representation, depending on which country you look at. Some work better than others. I would not say that we need to replace representation, but we certainly need to review our model in Portugal. Many citizens do not feel represented by politicians and we should not be afraid to discuss and evaluate our model. Only then can we identify weak spots and think about participation tools as a way to solve these weaknesses. Furthermore, participation should not only be seen as a way to solve representation issues. I believe participation is an essential part of our democracy, a condition for its existence which goes hand in hand with representation. The first Citizens' Forum deliberated 3 concrete ideas to improve communication between citizens and politicians. Palace of Belem, Lisbon, Portugal. January 17, 2017. Photography: All rights reserved. MS: Our political institutions should be those we decide to give ourselves as citizens. What institutions, from what you have found so far, are the Portuguese people willing to give themselves? LJ: The Portuguese people would probably appreciate having institutions with which they could have a regular, direct and active participation and discuss the topics that are most dear to them. We are voting every four years, and that’s it. The newspapers are not providing us with the information we need, nor are they prioritizing the problems that have the biggest impact in our lives. I think we need a place where we can get ourselves heard in a clear, direct and structured way, and where our voice can have a real impact. That is why we created the Citizens’ Forum.